One of my favorite books is Olaf Stapledon's Last and First Men, where the author writes a panoramic narrative of humanity's billion+ years of life from its First Men (us) to its Last (our far distant ancestors on Neptune). A factor in the First Men's downfall was their tragic inability to perceive the true nature of reality except in the most limited and distorted ways, and (even perceiving it) unable to act upon it. 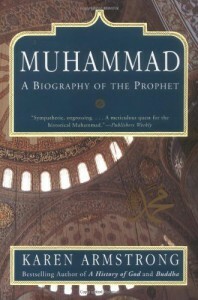 I was reminded of this reading Armstrong' very sympathetic portrayal of Muhammad in so far as a major part of her book charts the Prophet's evolving concept of Islam. Unlike Christianity, whose emphasis tends to be on the Kingdom to Come, Armstrong argues that Islam is solidly rooted in creating a just society in the here and now, and that the very concept of "separation of church and state" is inconceivable. Actually, that's just one of the themes Armstrong deals with. For all its brevity, this is a book solidly packed with ideas such as the transition from nomadic tribes to urban capitalists that tore Mecca (and all of Arabia) apart in this period. I'll confess to not being able to easily digest Armstrong when she accepts that Mohammad received a revelation from "God." The cynical atheist in me wonders what caused those episodes that resulted in the suras of the Quran. Was it a brain tumor? Epilepsy? Some other neurological disorder? The headaches the Prophet complained of before his death suggest to me (admittedly not an MD) some easily diagnosed (if we could get an MRI) physical problem. Yet he did found (or reveal) a faith that speaks to billions even today so wherever his inspiration came from it encompassed great insights. But, like Stapledon's First Men, so few of us are able to actualize them. I'd recommend this to anyone (non-Muslim, anyway) who is interested in learning about Mohammad from a sympathetic, though not entirely uncritical, historian and the origins of the third Abrahamic religion (in order of historical advent, not necessarily importance).